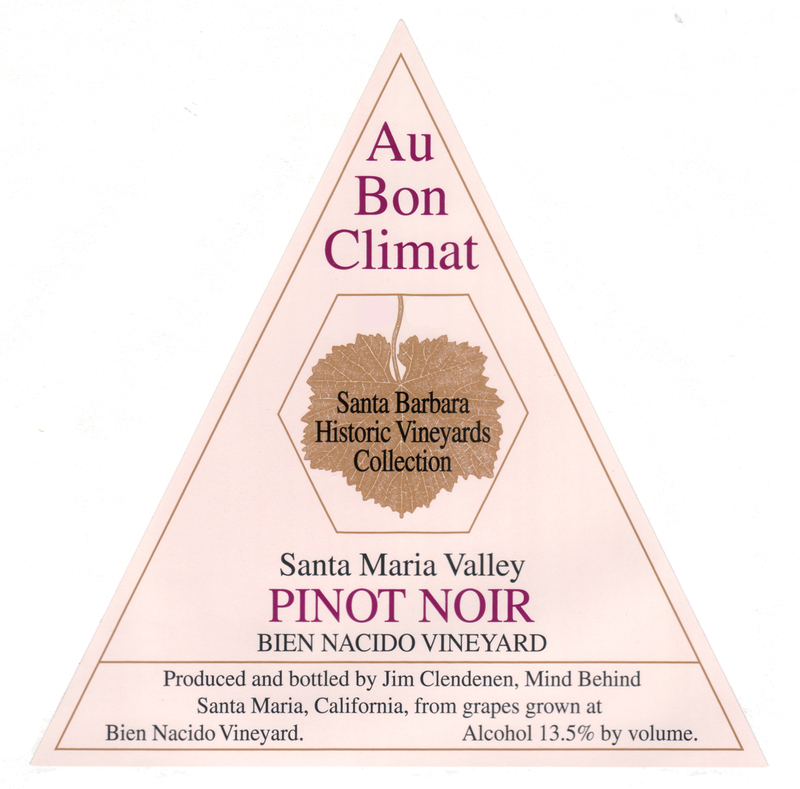 Au Bon Climat continues its homage to the many outstanding vineyards in Santa Barbara County with limited editions of its special designation Pinot Noirs and Chardonnays in their “Santa Barbara County Historic Vineyards Collection”. Since its founding in 1982, Au Bon Climat has sourced grapes from some of the most celebrated vineyards on the Central Coast. Some might say that Clendenen himself has contributed significantly to the reputation of these sites. This bottling is 100% Pinot Noir sourced from Bien Nacido Vineyard, which is home to the Au Bon Climat winery. The Pinot Noir fruit from Bien Nacido for this wine is clone 115 from block 2. Owned by the Miller Family, who were one of the originals to get started developing vineyards in Santa Barbara County. In the 1970s they began developing Bien Nacido as a commercial grape source selling fruit primarily to large producers from grapes planted along the valley floor. In the 1980s, smaller artisan producers such as Jim Clendenen convinced the Miller’s to sell them fruit in smaller quantities. These smaller winemakers benefited from the high quality fruit they sourced from Bien Nacido, and in turn these artisan bottlings, from up-and-coming rockstar winemakers, brought acclaim to the vineyard. The Miller family soon after invited Jim Clendenen to set-up his winery on their vineyard. And in the early 90s the vineyard started planting “custom blocks,” with long-term acreage contracts for quality hillside vines. Today, much of what Au Bon Climat sources is fruit that has been planted “exclusively” for them. Located on the receiving end of the east-west transverse mountain range, Bien Nacido Vineyard is a maritime-influenced desert. The morning fog cover and the cool afternoon breezes from the Pacific Ocean make this a Region 1 climate on the Winknler Scale. The rainfall averages 12 – 14 inches a year. The terrain is sand, chalk and marine loam that provides good drainage. The whole package results in cool, slow ripening grapes, with longer hang-time on the vines. This wine was made using 50% whole clusters. The fruit is fermented in small open top fermenters that receive manual punch downs twice daily. The fruit is then pressed and transferred to Francois Freres French oak barrels, 80% new, for 18 months. The wine is lightly fined with egg whites as needed and bottled unfiltered.